Many customers are struggling with their double chin that can be difficult to get away despite training and diet. A double chin often has nothing to do with your body weight, but has something to do with hormones or heredity. For many customers this is very frustrating and a double chin can make you look older, thicker and unhealthier. A Belkyra treatment can be a good option here. The active ingredient in Belkyra is a synthetic non-human and non-animal formulation of deoxycholic acid, which is a molecule already in the body. Deoxycholic acid is a digestive enzyme that degrades fat from the food we eat. When the product is injected into the fat beneath the chin, the fat degrades and destroys the cell membrane. Then the fat cells will not come back. 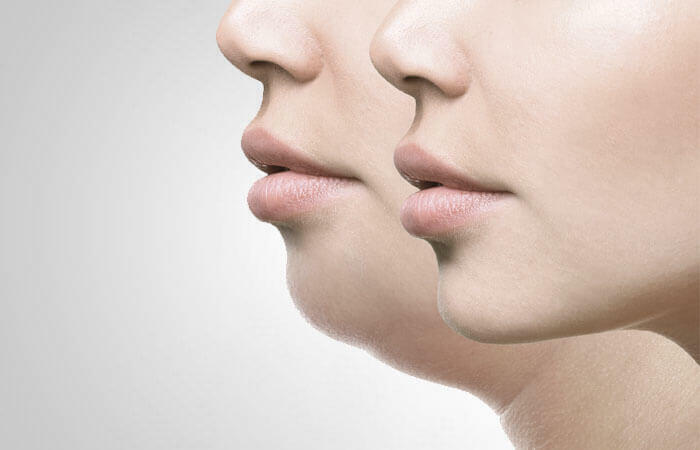 During 8-12 weeks, the treatment reduces the fat permanently and the double chin becomes smaller. Your double chin will be reduced without surgery. The best candidates for a Belkyra treatment are women and men over 18 years of age and which have a good health. The amount of fat that decomposes varies from patient to patient, and therefore the individual may need more than one treatment. We generally recommend 2-4 treatments for a perfect result. Maximum 6 treatments should be administered with at least 4 weeks between. Before your first Belkyra treatment at Inviocare, you must have a free consultation with our specialist in dermatology. It is also a legal requirement that you have 48 hours of reporting time before the treatment itself. Prior to treatment, the area is cooled down with ice bags that work pain relief and reduce the risk of bruising. After that, the injection sites are located with a template placed on the site. The number of injections varies from person to person but in average, you must have 20 injections per person. Synthetic deoxycholic acid is injected into the fat under the chin, which then reduces the fat and redefines your jaw. The treatment itself is associated with intense pain which decreases again approx. 5-10 minutes after treatment. It is normal and expected to swell a lot in the treated area after the treatment. The swelling will gradually decrease during the weeks after. It is also expected with bruises in the treated area. The skin will be numb and there may be tenderness and light hardness in the area for several weeks after treatment. The treatment is only performed by specialists in plastic surgery and dermatology.